After almost two decades in the doldrums, the West Indies team is giving signs of coming back to life. The side still has to cope with the Achilles-like sulk of former captain Chris Gayle—waiting until he’s paid enough money and respect to employ his bludgeon-like batting for the team rather than the various sides he turns out for if they pay him enough of both—but in other respects, the current team has the makings of a very competitive unit, especially in the batting department. The ever-reliable Shivnarine Chanderpaul continues limpet-like to keep the team from falling apart, while Darren Bravo and Kirk Edwards are putting in some serious scores in Test cricket. Devendra Bishoo is a major find as a spinner, and Darren Sammy is an enthusiastic captain, and a very useful all-rounder. True, West Indies actually lost the series (2-0) against India—but that’s no disgrace given the fact that India were playing at home, and the side has some of the greatest players in the world. The West Indians are young, and they have enthusiasm and commitment. 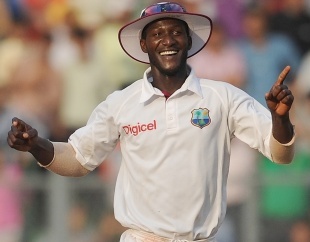 As the above picture of Darren Sammy celebrating the West Indies’ great escape in the third Test match (see Part II below) shows, the side is enjoying its cricket and, as long as there are no more ructions, it should continue to improve. All of which is very welcome, because the world of cricket has long missed the free-flowing brilliance of West Indian teams. This entry was posted in Cricket, India, Right Off the Bat Website, Test Cricket, West Indies and tagged Chris Gayle, Darren Bravo, Devendra Bishoo, Kirk Edwards, Shivnarine Chanderpaul. Bookmark the permalink.